Vending Machines Are Getting Healthier! Recently a client asked me if I knew anything about healthy vending machines. I looked into it and found that there has actually been a lot of new vending machine companies that now offer healthier foods in vending machines. I took a look at a few of the more popular vending machines companies and put together some info for other corporate clients, schools and hospitals. Keep in mind that these vending machine companies are primarily geared toward selling vending machine franchises to vending operators. But two of them do provide enough information to allow companies looking for healthy vending machines with information about their offerings and a means for client companies to contact them to inquire about adding a vending machine to their company. Companies with a high volume of usage will be more likely to be able to secure a vending machine versus small companies with fewer staff or vending machine usage. My top pick is Sprout! I really like the Sprout website and company approach. Check out this webpage for detailed specs on the Sprout vending equipment and an excellent video on how the vending machine combines non-refrigerated items with refrigerated items in one machine AND accepts coins, bills and credit cards easily. I really like Sprout’s website and approach to sales. They showcase themselves as a company of people committed to providing healthy products and creating a good working environment for their own staff. To inquire about setting up a Sprout vending healthy vending machine service in your office or school, click here. Your location does not have to pay for the machine! Its free! The Sprout Healthy Vending machine is provided at absolutely NO cost to the location. In fact, not only do we provide the machine, we service and stock it on a regular basis and then give you a percentage of the profits each month. Sprout Healthy Vending has a qualified professional Operator in your area who is responsible to monitor, stock and service the machines as necessary. Each of our Operators goes through extensive training and background checks to ensure that the quality of service provided is far superior to anything you have witnessed before. Your company can help select the products in each machine in your location. Sprout believes it is important to provide a good variety of healthy products in order to satisfy the taste of everyone. Your local Sprout Operator will meet with you to discuss potential products and you can provide a wish list of requested products from our extensive inventory. Sprout has licensed Dieticians on staff that create customized Menu Plans for each machines. They will take into account local, state and federal guidelines and build a menu plan that meets or surpasses those standards. Sprout products are all national Name Brand items. These are the same products you would expect to find on the shelves of your local Whole Foods and Trader Joes. I also like the Fresh Healthy Vendings website because it makes it easier for client companies to see all the available products they can choose for their vending machines. 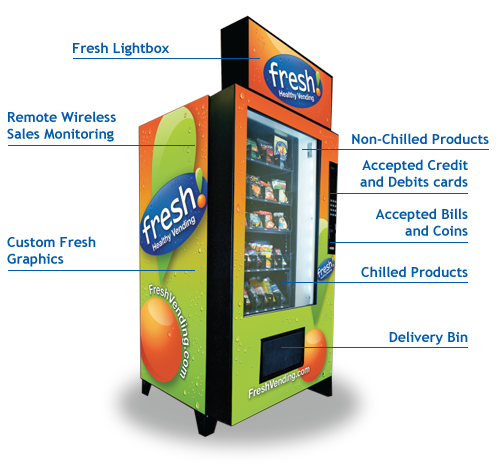 Fresh Healthy Vending has a clean, easier to navigate website and it’s easy to see exactly what products they offer. Fresh Healthy Vending offers Cliff bar products lines, Luna and Kashi Go Lean bars, Nature’s Path, Barbara and SoyJoy bars as well as dried fruit, vitamin waters, healthy juices, smoothies and yogurt. Check out the scrollable product options here. To get more information on starting a Fresh Vending Franchise or to order a Fresh Vending machine for your location, click here and fill out the online form. Sad to say that Healthy Vending Machines by HUMAN may be a great company, but the website looks like a giant confusing infomercial. 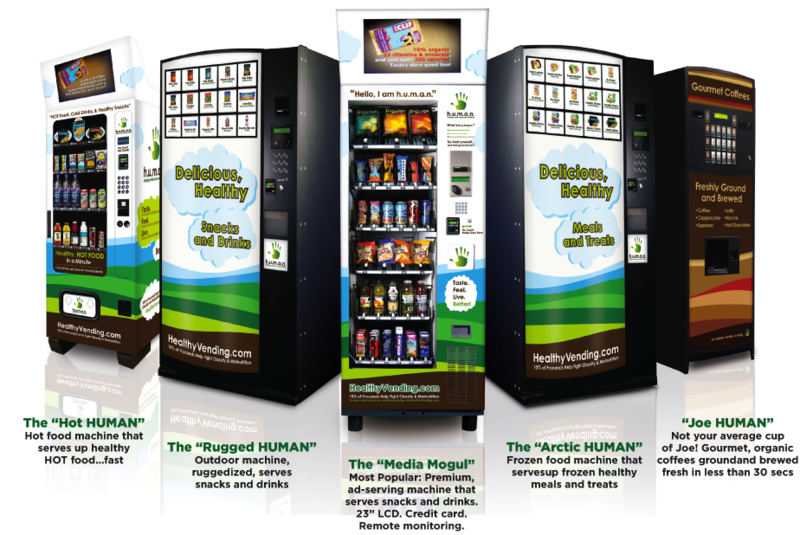 When I think of HUMAN, the vending machine company, the phrase that comes to mind is “stressful clutter.” I could not get much information about any of their products, other than they are “customizable” and “healthy”. I had to go through several web pages to find a general list of the type products they offer (granola bars, juice, etc. ), but found no specific product lines mentioned. Thus their website does not list any brand name products to allow me to compare HUMAN’s offerings with the other two healthy vending companies. I also do not like their video display terminal on the top of some of their vending machines. People at work are already under stress and stopping to grab a healthy snack should be a BREAK from computer monitors. Adding yet another video display with canned advertising content adds MORE stress to office workers. Be kind to human beings, HUMAN, and get rid of the annoying video displays on your machines! We are already bombarded with commercials on television, at air ports and in elevators. Do we really need yet more commercial clutter on our vending machines? The HUMAN website is also difficult to navigate and cluttered with videos promoting their services. Their sales approach is so cluttered, confusing and hard sell that I would not recommend them for any of my client sites. Go with Sprout or Fresh Vending instead!